At the Institute for Ion Beam Physics and Materials Research three MeV accelerators are used for ion beam analysis with state-of-the-art experimental setups. The general layout shows the arrangment of the accelerators, beam lines and target positions in the laboratory. 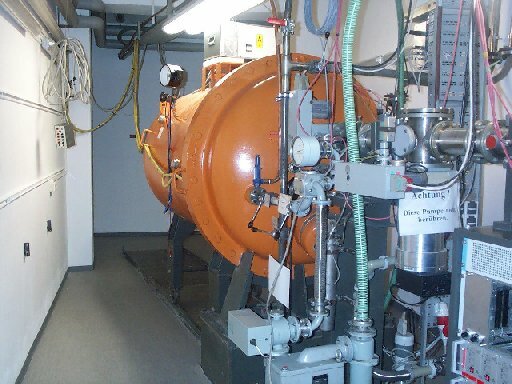 The single stage 2 MV van de Graaff accelerator provides p, d, and He ions and is mostly used for RBS/channeling, but also for NRA and He-ERDA. The 3 MV Tandetron is used both as high current MeV implanter and for various ion beam analytical work. A sputter ion source provides a wide variety of negative ions and the RF source with a lithium vapour charge exchange cell delivers a He beam with currents up to a few hundred nA, sufficient for RBS measurements. Three beamlines with dedicated experimental facilities follow a first switching magnet. A forth beamline is directed to an adjacent hall, where a second switching magnet distributes the beam to additional experimental facilities. 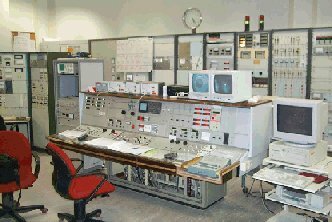 Ion sources: Cs sputter ion source IONEX 860-C. 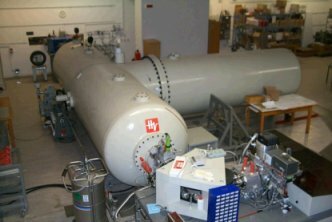 The vertical 5 MV Tandem accelerator is mainly employed for ion beam analysis and to a lesser extend for high energy ion implantation. Three ion sources, a sputter source, a duoplasmatron and a He ion source are available, but provisions are made for the permanent installation of two other types of sources. Ten beam-lines in two spacious experimental halls offer wide possibilities for the installation of various experiments. Seven of them are eqipped with facilities for material research, two are used for ion implantation or irradiation.